Respiratory organs formed of extensible tissue, in which air from the nasal and oral cavities is carried, ensuring oxygenation of the blood. Section of the left lung separated from the upper lobe by the oblique fissure. Channel leading from the trachea; it allows air to enter and exit the lung, and branches out inside the lung. 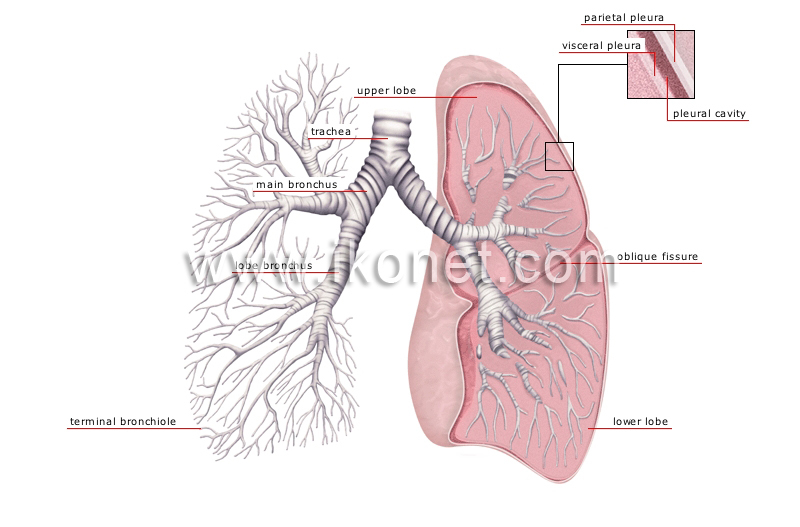 Branch of the main bronchus ending in a pulmonary lobe and dividing into smaller and smaller bronchi. Muscular cartilaginous tract that is a continuation of the larynx; it divides into two main bronchi, each of which ends in a lung, and allows air to pass. Deep ridge bounding the upper and lower lobes of the left lung and at the back of which the visceral pleura lies. Section of the left lung separated from the lower lobe by the oblique fissure. Final branch of the bronchus having no cartilage and ending in small air pockets (alveolae) where gases are exchanged with the blood. Space between the two pleurae containing a lubricating fluid (pleural liquid); it facilitates their sliding and thus aids breathing. Outer elastic layer of the pulmonary casing; it adheres to the thoracic wall and the diaphragm. Inner elastic layer of the pulmonary casing covering the lung and fissures; its elasticity allows the lung to change size.